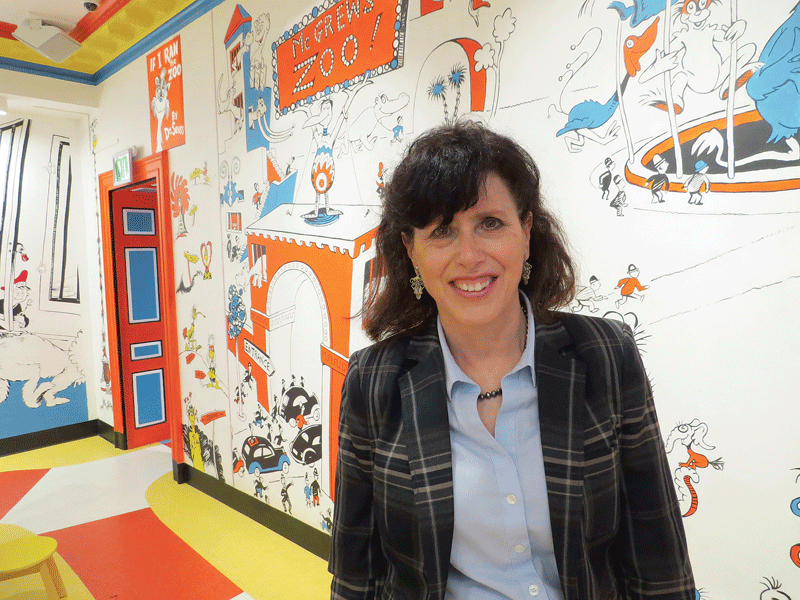 Kay Simpson says the Seuss museum has fueled a surge in attendance at all the museums at the Quadrangle. 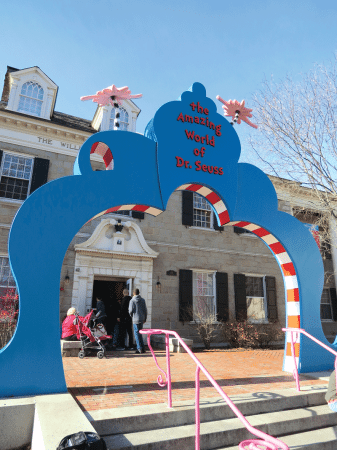 Since it opened nine months ago, the Amazing World of Dr. Seuss Museum has sparked a series of attendance records at the Quadrangle and driven visitorship higher at all five museums at the complex. 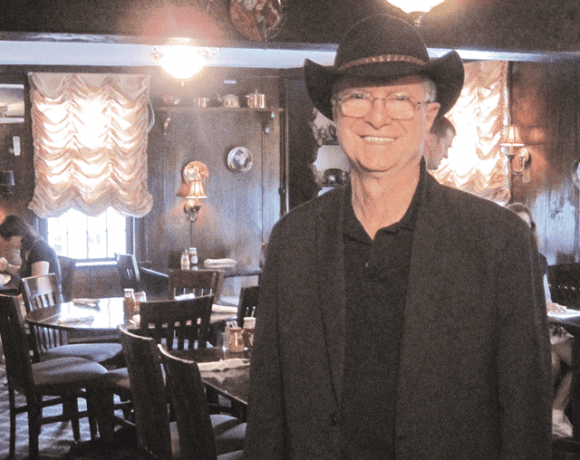 Meanwhile, it is also inspiring museum officials to consider improvements to those other facilities, and plans are in the formative stage for renovations to the science museum. 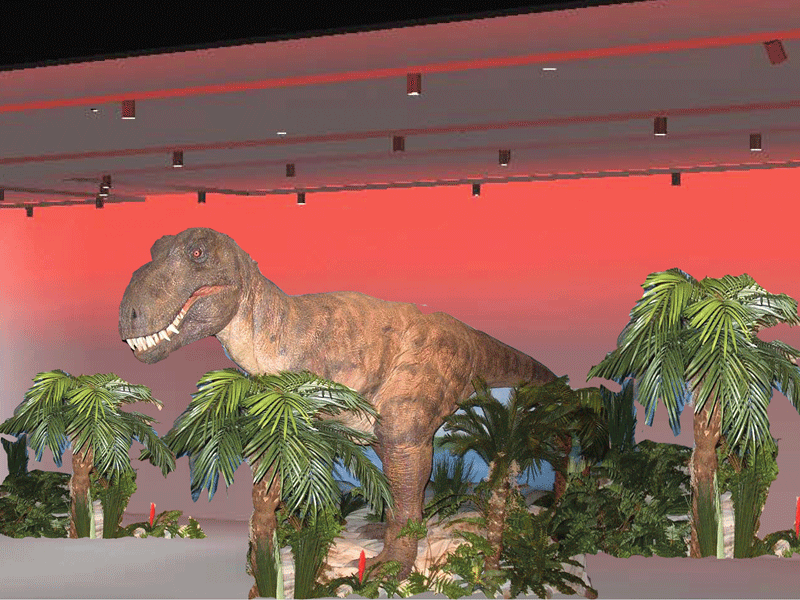 Kay Simpson couldn’t recall the specific name of the exhibit; she just remembered that it featured what she called “robotic dinosaurs,” which were a huge hit and are still talked about 14 years after they made their appearance at the Springfield Museums. Simpson, executive director of that venerable institution, brought up the dinosaurs as she talked, on Presidents Day, about the school vacation week ahead, and whether the Museums, buffeted by the Amazing World of Dr. Seuss Museum, which opened last June, could eclipse the record for winter-school-break attendance the dinosaur exhibit helped set. Turns out, she was right. The dinosaurs have kept their place atop the charts, due in part to a sunny day in the ’70s that prompted many families to head outdoors, not inside a museum. But nearly nine months after the Seuss museum opened its doors, just about every other attendance mark has fallen. That includes the one for Columbus Day. And for the day after Thanksgiving. And for Christmas school vacation week. Overall, the numbers are stunning. When the museum was being pitched to potential funders years ago, it was thought it would provide a 30% overall boost to attendance, said Simpson, noting, by way of comparison, that when the Lyman and Merrie Wood Museum of Springfield History opened in 2009, the bump was roughly 12%. Instead, attendance from June to August soared 300% above the total for that same period in 2016. In fact, attendance last summer equaled the mark for the entire year in 2016. As for the full year in 2017, attendance doubled the mark of the year previous, with only seven months of Seuss. Looking ahead, well, officials don’t know just what to expect. They believe that, eventually, as more people take in the new museum, the pace of attendance growth will start to diminish, although it will still be significant, especially with MGM Springfield set to open in the fall. When ‘eventually’ will arrive, though, is a huge question mark, as the new museum continues to draw people from not only across the region but throughout the country and around the world. Indeed, just a few months ago, surveys of attendees revealed that residents of all 50 states had found Springfield and the Seuss museum. The last one in? Neither Simpson nor Karen Fisk, director of Public Relations & Marketing, could recall exactly, but they believe it was one of the Dakotas. The Seuss museum has brought many things to the Quadrangle — visitors, revenue, publicity, and momentum come to mind quickly. But also something else: the motivation and inspiration to upgrade other facilities at the site. And officials would like to start with the still-popular, but often-maligned science museum, which has been described as ‘outdated’ and ‘static’ by many, including Baby Boomers who are bringing children and grandchildren to see the same exhibits they saw a half-century ago. Simpson, while still proud of the facility and the ornate dioramas that in many ways define the facility, acknowledged that it is not as modern and interactive as this era demands, and the museum is putting preliminary plans on the drawing board to address these shortcomings. The arch in front of the Seuss museum has become a sought-after backdrop for photos involving visitors from around the world. And there are plans now taking shape to do just that, as we’ll see later. They call for taking many of the displays that have been behind glass for the most part and bringing them to life. For this issue and its focus on tourism and hospitality, BusinessWest looks at both the incredible boost that the Seuss museum has provided for the Quadrangle and the plans to build on this momentum. Simpson recalls that, when the Museums announced plans to put a colorful arch in front of the Seuss museum (the former history museum built like a stately home from the late 18th century), not everyone was pleased with the concept. Indeed, there were some who thought the feature clashed architecturally with the classical buildings around it and wouldn’t be a good addition to the historic Quadrangle. But, while some still think in those terms, this arch is rapidly becoming one of the city’s most recognizable landmarks and sought-after photo backdrops. It’s not in the same league as the St. Louis Arch, that iconic ‘Welcome to Fabulous Las Vegas Nevada’ sign, or the Rialto Bridge in Venice, but … it’s getting there. The popularity of the arch is just one of many signs of the awesome power of Dr. Seuss, the characters he created, and the attachment people have to his work decades after they first read one of his books. Others include the variety of license plates in the Museums’ parking lots; the huge increase in sales in the gift shop, where a large percentage of items are Seuss-themed; the vast amount of press the Seuss museum has garnered, from outlets ranging from the Denver Post to Architectural Digest to Condé Nast Traveler; and, of course, all those new attendance records. But maybe the most intriguing, and also entertaining indicator of the author’s gravitational pull is the collection of comments in the guest books visitors are asked to sign. Some, especially those penned by the very young, are short and simple, like ‘this is the best museum ever,’ in large, bold letters. Others reveal how far people have traveled to take it all in, like ‘so happy this museum has opened for all of us. Much love from Indiana,’ with a little heart drawn as a form of punctuation. Who made reading fun around the clock. We came all the way from Philly! Overall, the pages are dominated by prose, little hearts, some attempts to draw Seuss characters, and lots and lots of exclamation points. And then, there was this entry, which no doubt caught the attention of museum administrators. Indeed it does, as was evident during school-vacation week, when, as noted, a near-record number of people took in not only the Seuss museum, but some of the other four museums on the site. Most need to do that almost out of necessity, because the Seuss museum is relatively small and exceedingly popular, which means many visits to it are timed — an hour or so on average after arrival. So visitors are using that time to also take in the history museum, the Michele and Donald D’Amour Museum of Fine Arts, the George Walter Smith Art Museum, and the science museum. So, while the arch is the gateway to the Seuss museum, that facility has become a gateway to the rest of the Quadrangle. And with this increased visitation comes recognition of the need to put these facilities on something approaching the Seuss museum in terms of earned hearts and exclamation points. Especially the science museum, originally opened in 1899, and for the reasons stated earlier. As she led BusinessWest on a quick walk-through of the science museum, which has been expanded several times since the 1930s, Simpson engaged in some multi-tasking. She was pointing out, with discernable pride in her voice, the quality, beauty, and historical significance of those aforementioned dioramas, as well as their ability to bring visitors closer to the animals in question than they could ever get at a zoo or in the wild. At the same time, though, she was explaining that, in this age of interactivity and digital technology, these displays are certainly static. With that in mind, the plan — again, still in the formative stage — is to make what’s behind the glass spill into the middle of the room. Elaborating, she said that today, much can be done with dramatic lighting, and the museum plans to use it to create opportunities to take in a woodland scene, for example, in the morning, afternoon, and evening, just by visitor-activated lighting. Preliminary plans call for making the science museum more modern and interactive. Meanwhile, the renovated displays will be multi-sensory, she went on, adding that visitors will be able to see, hear, touch, and even smell a number of different settings. 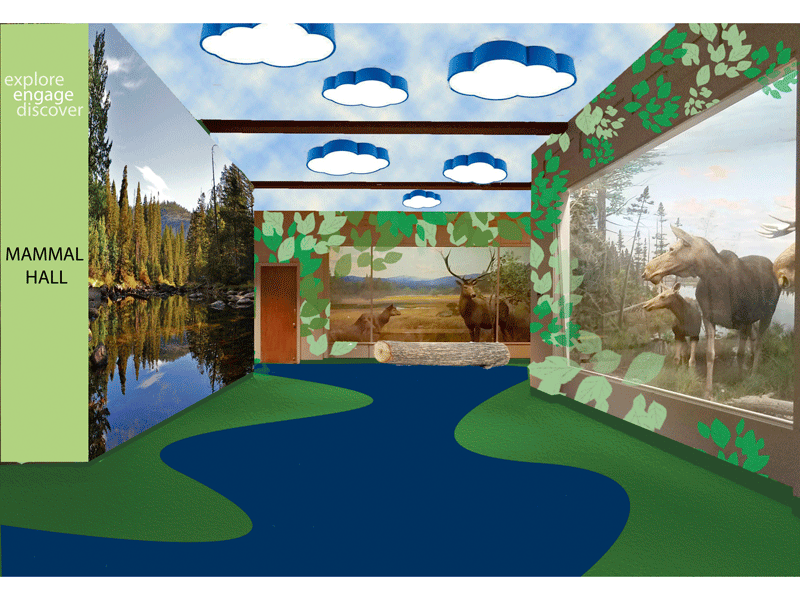 The carpeting will be patterned to simulate the floor of the jungle, for example. The second floor of the museum, meanwhile, will likely feature a Spark!Lab, the only one in the Northeastern U.S. Undertaken in conjunction with the Smithsonian (the Museums are an affiliate), Spark!Lab is a hands-on, STEM invention workspace where visitors can learn about and engage in the process of invention, said Simpson, adding that this addition will bring a new create a new level of interaction at the science museum and bring visitors back repeatedly. “How perfect is that for Springfield, given its long history of innovation and firsts?” Simpson asked rhetorically, adding that the lab will be an exciting addition aimed at generating interest in the sciences through direct involvement. All this is ambitious, said Simpson, and the museum will need to aggressively raise funds to make it happen. But initial talks with foundations and other funding sources is underway, and momentum created by the Seuss museum is generating enthusiasm to improve other facilities within the Quadrangle. The plan is to take on the project in phases, she said, with phase one being lighting, carpeting, and renovation of the bathrooms. If all goes according to plan, these changes could be undertaken late this year or early next year. Phase two would be the “complete immersion” she described earlier, which would come with a much larger price tag. But there is a need, and now a commitment, to upgrade the facility. “We’ve made the science museum a priority because people repeatedly ask us when we’ll update that facility; we’ve heard that on TripAdvisor, and we’ve heard that anecdotally,” said Simpson, adding that, while attendance is up at all the museums, again because of Seuss, the greatest surge has been recorded at the science museum, and to drive attendance higher, and bring people back, changes are needed. As noted earlier, administrators at the Museums don’t know when — or even if — the power surge from the opening of the Seuss museum will start to lose some of its intensity. They don’t know when or if the Quadrangle will stop setting attendance records for specific dates, weeks, or months between now and June. (Remember, winter break was an outlier due to those robotic dinosaurs and a summer-like Wednesday afternoon). What they do know is that the Seuss museum has been inspirational, and not only to those from Philly who take to prose and note that the facility is silly. It is also inspiring those at the Quadrangle, who want to raise the bar across the board — and plan to start with the science museum. If all goes as planned, it will likely earn some hearts and exclamation points itself. And maybe even some of that prose. Kay Simpson will settle for people young and old saying they had an enriching learning experience.